In this book Adam Banks uses the concept of the Digital Divide as a metonym for America's larger racial divide, in an attempt to figure out what meaningful access for African Americans to technologies and the larger American society can or should mean. He argues that African American rhetorical traditions--the traditions of struggle for justice and equitable participation in American society--exhibit complex and nuanced ways of understanding the difficulties inherent in the attempt to navigate through the seemingly impossible contradictions of gaining meaningful access to technological systems with the good they seem to make possible, and at the same time resisting the exploitative impulses that such systems always seem to present. Banks examines moments in these rhetorical traditions of appeals, warnings, demands, and debates to make explicit the connections between technological issues and African Americans' equal and just participation in American society. He shows that the big questions we must ask of our technologies are exactly the same questions leaders and lay people from Martin Luther King to Malcolm X to slave quilters to Critical Race Theorists to pseudonymous chatters across cyberspace have been asking all along. According to Banks the central ethical questions for the field of rhetoric and composition are technology access and the ability to address questions of race and racism. He uses this book to imagine what writing instruction, technology theory, literacy instruction, and rhetorical education can look like for all of us in a new century. 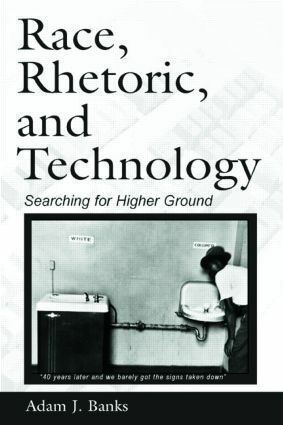 Just as Race, Rhetoric, and Technology: Searching for Higher Ground is a call for a new orientation among those who study and profess African American rhetoric, it is also a call for those in the fields that make up mainstream English Studies to change their perspectives as well. This volume is intended for researchers, professionals, and students in Rhetoric and Composition, Technical Communication, the History of Science and Society, and African American Studies. "Bank's book is one that argues for a balance between individualism and assimilation into the dominant culture….he illustrates his recognition of the value of holding to traditional values, morals, music, and language (attention to differences) that are often shared among members of a minority population but with full recognition that the exclusive celebration of such differences has often come at the cost of a failure to share in gains of the majority population driven by technology - too much of a focus on difference or similarity is detrimental and destructive." "With this debut book, Adam Banks has taken…the study of African American Rhetoric, perhaps even the field of Rhetoric and Composition more broadly, fully into the twenty-first century, for this is the most sweeping, intelligent, and provocative articulation we have of racialized rhetoric and social justice, and their connections to issues of technology and design." "…an impressive piece of scholarship about a neglected topic of huge importance for the field of rhetoric/composition….The field needs to hear what Adam Banks has to say." "I think Adam Banks has a real winner here--a book that will knock the socks off of readers who are used to the same-old-stuff about technology." "Banks' passion for fighting injustice continually encourages us to match his dedication by further investigating the transformative work of African-American rhetoric and technological progress." Contents: K. Gilyard, Foreword. Preface. Prologue. Introduction: Looking for Unity in the Midst of Madness: Transformative Access as the ONE in African American Rhetoric and Technology Studies. Oakland, the Word, and the Divide: How We All Missed the Moment. Martin, Malcolm, and a Black Digital Ethos. Taking Black Technology Use Seriously: African American Discursive Traditions in the Digital Underground. Rewriting Racist Code: The Black Jeremiad as Countertechnology in Critical Race Theory. Through This Hell Into Freedom: Black Architects, Slave Quilters, and an African American Rhetoric of Design. A Digital Jeremiad in Search of Higher Ground: Transforming Technologies, Transforming a Nation.